A natural product made by bees from the nectar of the thyme plant flowers. Flowering time: Between March and July, along Spring. Colour: Dark amber or yellowish orange. Consistency: Somewhat thick, soft to the throat. Treatment: All our honey is either natural or raw, without pasteurization and microfiltration processes that makes honey soft and liquid but does not change its composition and properties. Natural Thyme Honey without additives, added sugar, starch, food colorant or preservatives. Where it comes from: All our honey comes from western mediterranean area, with the advantages that come from the type of flowers located in the area and duration of the plants due to the mediterranean clima. In cold conditions can crystallize and become less fluid, but with the heat returns to its original state without losing its qualities. 2 What is recommended for Thyme Honey? Helps to overcome the physical and mental exhaustion. Helps digestiion after a meal. Aids sleep, it is antiseptic and it is reccomended for the prevention of infections and infectious respiratory and digestive diseases. It is a complete food supplement and is also rich in copper and boron. 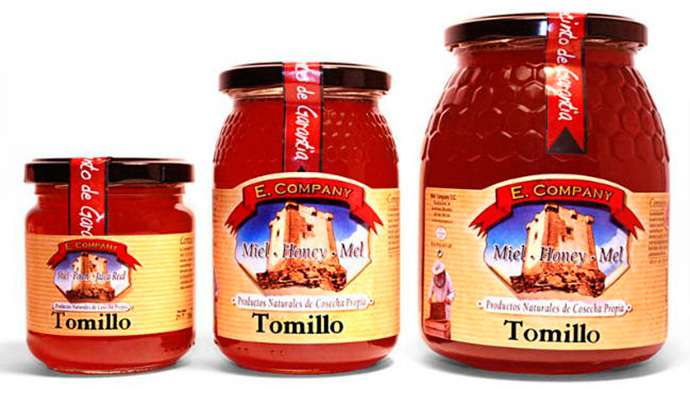 At lamieleria.com we produce and package our own honey, jar by jar, completely handmade since more than 80 years, without adding any food colorant or added sugars. Our honey is 100% natural. Help section: In the Help section, you can find frequently asked questions about our web. Messages: If you still have doubts, you can leave us a message here and we will answer as soon as possible. Contact telephone: You can call us at (+34) 965 590 334 between the hours of 9am to 2pm, and 4pm to 7pm, Monday to Friday. We will be delighted to help you with anything we can. 4 Where to buy Thyme Honey? At our online shop lamieleria.com we have different size containers of Thyme Honey. Press here to buy Thyme Honey now at the best price available and start enjoying now.